(Engine specs) • Table below is from 2018; measurements are in inches unless specified otherwise. Towing Don’t try to tow! All 2018 Corollas had bi-LED headlights, with integrated LED daytime running lights. Base wheels were 15-inch (P195/65 tires), with LE going to P205/55R16, LE Eco to P195/65R15, XLE going to P205/55R16, and SE (and XSE) to P215/45R17. There were jsut three wheel sizes: 15 x 6 steel (L, LE Eco), 16 x 6.5 (steel or aluminum), and 17 x 7.0. The CVT had a range of 2.480 to 0.396; in reverse, 2.604-1.680. The six-speed ratios went from 3.638 to 0.619, with a 3.33 reverse gear; the differential on CVT was 4.76:1, on manual 4.214:1. Note: we are only including changes from 2002 models; 1999 specs are further down the page, and older specs are on our history page. The Corolla really seems to blow away the Civic in specs, and certainly does well in passenger comfort. 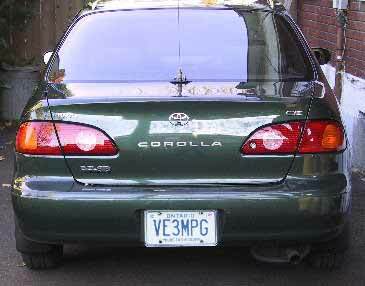 U.S. Army Engineer Tan Nguyen wrote: "The 1ZZ-FE (engine) changes for the 2003 Corolla is primarily the larger I.D. throttle body and the switch to the plastic intake manifold shared with the Celica and MR-2 Spyder which has the shorter intake runners. If the North American market had the Direct Injection, the engine will be labeled 1ZZ-FSE, with the 'S' signifying Direct Injection." The Corolla's getting to be as big as the Neon and Civic...with better reliability... (all models tested have four doors). Note how much faster it is than the base Civic! The Neon is considerably faster than either the Civic or Corolla, and handles better, but gets relatively poor gas mileage (comparable to Elantra). Neon's due for a "refreshing" in 2003. New Cavalier and Saturn are also coming with a new 2.2 "Ecotec" engine. Civic HX has 117 hp, higher gas mileage ratings; 2003 Neon SRT to have 205 hp. Pricing for the 2002 Corolla is actually lower for popular option packages. The CE starts at $12,568, while the LE starts at $13,383, at least $2,000 less than in the past. Otherwise, the 2002 Corollas are identical to the 2001 models. The 2001 models have better headlights (4-beam), new front and rear styling, new fabrics, and, in some models, map lights on the rear view mirror and dual rear cup-holders with a larger rear center console. The VE is gone, replaced by a sporty-looking and bare-bones S model whose price ranges from $13,000 to $17,000. Gas mileage is slightly better. An inside-trunk safety release has been added. (Because the S model is pretty much an option package, we will not dedicate a page to it). --Available child safety seat (CE,LE) - good luck getting one!